I haven’t posted much lately because I haven’t painted much for a couple reasons – we’ve been very busy and I haven’t had much inspiration. Sometimes I feel like I’ve forgotten how to paint. It seems like I go in spurts – very inspired and paint like crazy – to not having anything to paint and nothing inspiring me. You may look at the painting below and think something must have inspired me to paint those colorful orange tomatoes and tea pot. I was inspired but not in the regular way. There’s an oil painter whose work I really love named Aaron Lifferth. He has a great style – very loose and his color choices are beautiful. Since I didn’t have anything to paint one day I thought I would try to replicate one of his paintings. It was a lot of fun and I actually did that with three of his paintings. They were done very quickly in my sketch book. This was the first one of three that I did. Aaron gave me permission to post these. You can see his original oil painting which is much better here. I’ll post the other two sketches I did of his paintings later this week. I’m hoping I’ll get lots of inspiration next week. We leave Wednesday for a ski trip in Utah – we are very pumped!!! If I don’t have any paintings turn out to post hopefully I’ll at least have some good pictures of our trip to post… so stay tuned, because I hope to get back to posting much more! A great painting as usual Sandi! Dennis framed my “girls” painting for me, and it is hanging in a place of honor in our Great room! Love, love, love it! will get your creative juices flowing again. Thank you Susan – you are always so faithful to leave me an encouraging and sweet comment – thank you for taking time to do that – it means a lot! Way to go Dennis!!! Thank you for your prayers! We’re looking forward to getting away and enjoying the beautiful scenery and snow out west. 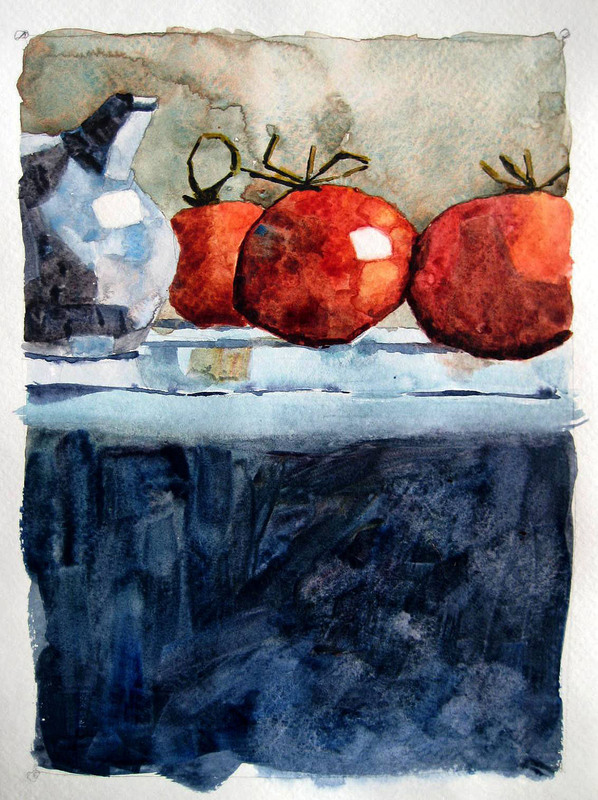 Love this tomato painting. Excellent composition and use of watercolor!